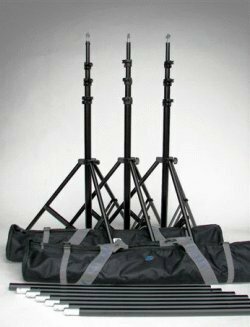 JTL Heavy Duty Background Support Kit #5036 is designed with versatility and easy of use in mind. It features: 1. three spring-loaded supporting stands (4-sections), wide legged and super sturdy 2. dicentric locking latches (design patented) 3. oversized knob adjusting the base of center pole 4. cross-bar set of 9 pieces (showing 7 in picture) for extendable 30' width, sagging resistant 5. two handy carrying bags for travel 6. a dual-function wrench for self-maintenance 7. aluminum poles/bars and steel legs both with metal surface finish (scratch-resistant) 8. same-day shipping if ordered by 12pm, Monday-Thursday (Western/Pacific time zone) Manufactory one-year-warranty has been offered by JTL Studio Systems Inc. in Los Angeles, California for 25 years. For more product information and after-sale services please call us at (714) 670-6626 9:00am-5:00pm Monday-Thursday ( Western/Pacific time ) or send your inquiry through email to service@jtlcorp.com. Manufactory one-year-warranty has been offered by JTL Studio Systems Inc. in Los Angeles, California for 25 years. For more product information and after-sale services please call us at (714) 670-6626 9:00am-5:00pm Monday-Thursday ( Western/Pacific time ) or send your inquiry through email to service@jtlcorp.com. Manufacturer: JTL Studio Systems Inc. Publisher: JTL Studio Systems Inc. Studio: JTL Studio Systems Inc.